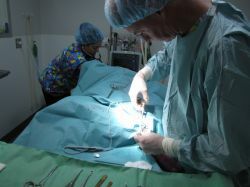 Surgery is conducted Monday to Friday in our dedicated sterile operating theatre. We not only have advanced equipment to monitor your pet whilst anaesthetised (Heart & respiratory rate, oxygen levels, blood pressure, ECG & body temperature) but have a dedicated nurse monitoring your pet’s progress during the anaesthetic till recovery. Dr Murray Collings heads the Surgery team and is particularly skilled in soft tissue and orthopaedic surgery having achieved post graduate qualifications in surgery at the University of Melbourne at Werribee. Minimally invasive surgery has many benefits for both cats and dogs, with a much smaller opening into the abdomen, your pet will recover faster and this means for dogs – we do not restrict activity for as long as conventional abdominal surgery. 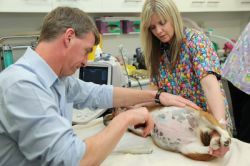 Dr Murray Collings is a skilled Surgeon and has taken an interest in Laparoscopic surgery and is one of only a handful of non Specialist Vets in Melbourne offering this procedure. Admission is by appointment with the Surgery Nurse. Please allow 10 minutes. Discharge is by appointment with the Vet. Please allow 10 -20 minutes. Revisits are by appointment, generally 3 days and 10 days post surgery to evaluate your pet’s progress. To keep your pet safe and healthy whilst under General Anaesthesia all dogs and cats receive Intravenous Fluid Therapy. We recommend Pre Anaesthetic Blood testing prior to anaesthesia. For more details why this is good for your pet, see Scout’s story.